Blog / Hurricane Season is Here. Is Your Roof Ready? Hurricanes are a part of living in most coastal areas in the U.S. and preparing for them is essential to keeping you and your family safe. This preparation is also essential to protect your largest and most important investments: your home and business. While the development of tropical cyclones (hurricanes) is possible anytime of year, activity is more likely during the official Atlantic Hurricane Season, which spans from June 1 to November 30. The 2018 season has already been marked by the early development of Subtropical Storm Alberto (May 25). Alberto is one of a record four subtropical storms to occur in a single season, which hasn’t occurred since 1974. This longer-lasting storm activity and increase in frequency has led experts to warn of an increased threat of hurricane impact and serves as evidence that anyone on the eastern US and Gulf of Mexico coastlines should stay prepared. With Florence, currently a Category 4 hurricane, making its way toward the South Carolina, North Carolina and Virginia coastlines, millions of people are heeding evacuation advice to ensure their safety. The last thing they need to worry about at this time is how their homes and businesses will fare through the storm. During extreme weather events, the roof is one of the most vulnerable areas of a structure, evidenced by roof cover damage accounting for most insurance claims not related to storm surges during hurricanes. Roof cover damage is one of the most dangerous and devastating effects of a hurricane as even partial damage can leave the rest of your structure vulnerable to wind, water and other elements. 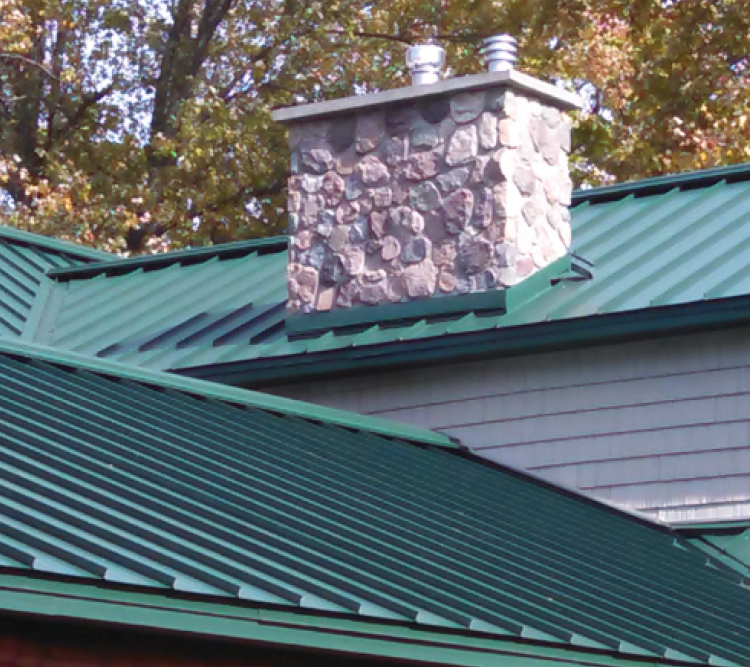 Metal roofing has the ability to resist winds up to 140-mph and features interlocking panels that provide unique strength and security. This durability enables metal roofing to withstand abuse from not only the high winds of tropical storms and hurricanes, abut also wildfires, hailstorms, tornadoes and floods seen across the country. Metal roofs also have fewer seams, meaning there are fewer entry points for water that can potentially soak attic insulation and cause ceiling collapse and other damage. In addition, a properly-installed, thick-gauge metal roof can last up to 50 years before needing to be replaced—more than double the lifespan of traditional asphalt shingle roofs. As with any kind of roof, maintenance is integral to protecting your investment. Simple precautions can be taken to ensure your metal roof is kept in optimal condition and ready for hurricane season. Prevention is key. To maintain the strength and durability of your metal roof, have a licensed metal roofing professional inspect your roof regularly. While you can always manually inspect your roof, a qualified roofing inspector can thoroughly examine it, identify areas of concern and provide you with a detailed report including roof life expectancy, pictures of your roof and repair estimates. Professional inspectors can also make hurricane preparedness recommendations based on your particular roof. When rust develops on metal, it can accelerate degradation, compromising the structural integrity of your structure and leaving it vulnerable—particularly in inclement weather. While ABC offers galvanized and coated metal panels that prevent rust from occurring, standing water and heat from direct exposure to the sun can degrade this protection over time. Therefore, it is important to regularly check for rusty and loose screws as well as flaking paint which can also cause rust to develop. If rust is discovered, contact your roofing contractor for repair options. An added layer of protection from high winds, hurricane straps (also known as roof tie-downs) securely tie rafters to load bearing walls. Made of galvanized metal, they can attach to any type of roof, protecting it and the structure beneath, as well as keeping it from detaching and causing damage to nearby structures and objects. Many homes already have them (depending on how old the roof is), but even structures with hurricane straps should be checked to make sure they were installed properly. While metal roofing provides the most protection against wind-related damage as compared to other roofing material, reinforcing your metal roof can decrease the likelihood of damage—particularly if your structure is located in a hurricane-prone area. Reinforcements can include overlapping sturdy materials on top of your roof, such as adding heavier metal panels or two-by-fours for added strength. When inspecting your roof, a professional roofing contractor can advise you on reinforcements suitable for your structure. Gable ends experience a lot of exposure to high winds, making them vulnerable to wind damage. If your structure has a gable end, ensure that it has been solidly built and is braced appropriately. Trees that hang over your roof and near your home can be dangerous any time of year, but particularly during a hurricane. Falling tree limbs can cause severe damage to your roof and allow water into your structure, cause electrical issues, or even injure someone inside. Trimming your trees to keep them away from your metal roof is an easy way to prevent damage and injury. If there are issues with your roof, chances are that you will eventually see their damaging effects inside the structure. While it’s ideal to catch issues before they can be seen inside, always be on the lookout for spots and stains on the ceiling, peeling paint, damp areas and daylight seeping in—all of which are serious indicators of a compromised roof and should be addressed immediately. Installing a metal roof on your structure is the first step to preventing damage during hurricane season, but these precautions can also serve to prevent extensive damage and safety risks, saving you time, money and heartache. 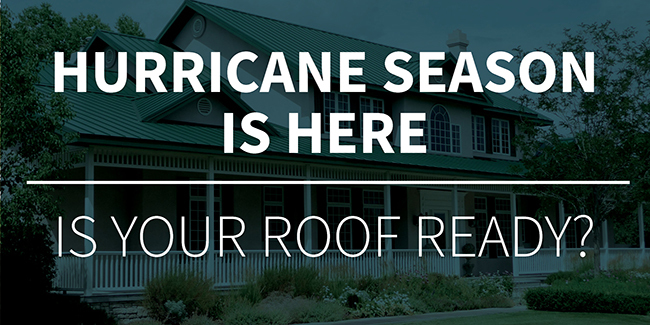 For more information on preparing your roof for hurricane season, contact your local ABC representative or distributor. Note: This post was updated from a previously-published version.